Love is in the Air! Marriage on your mind? Today we would like to share with you this unique and romantic marriage proposal ideas. Talk about an elevating experience, this idea will work if you are planning a trip together around the time of your proposal. The idea is unique, exciting, and fun! Sure, marriage proposals are always memorable, but few are exceptional. Creative marriage proposals will not only catch her off guard, but have her gawking at your creativity. This pilot had a unique wedding proposal when he popped the question to his girlfriend after convincing her that the private plane he was flying was malfunctioning. 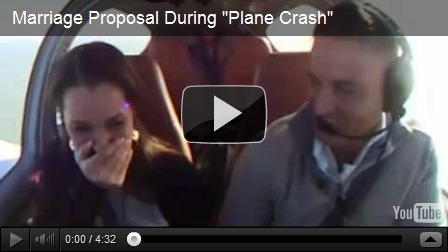 The pilot asks his girlfriend to read a specially made emergency checklist that ends with a wedding proposal. If you are planning to say the magic words, follow us during next week’s and check out the most original and coolest marriage proposal videos! In this day and age, it is important to tailor your unique and unforgettable marriage proposal to your special someone and their unique atmosphere. 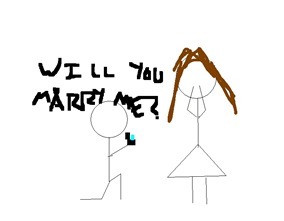 Some people imagine a modest, classic, down on one knee in an elegant restaurant after a night on the town. Other, more adventurous individuals may be picturing an extravagant surprise or a public to-do. Still, even though you may know your loved one backwards and forwards, you want to make sure they say yes- and you want them to say it emphatically. One of the biggest mistakes people make is thinking that there should be a crowd of strangers or family as spectators. For some women, that’s just right. But for most, it is not! Do you have any suggestions? You are all welcome to share your great ideas, inspiring stories or suggestions with everyone in our blog. The best wedding proposals come straight from the heart!